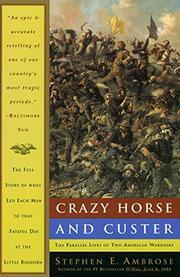 With the centennial of Custer's Last Stand at the Little Big Horn less than a year away, it's likely that we'll have to cope with more than one book on the protagonists. This one is by a professor of history at the University of New Orleans who has also written on Eisenhower, West Point and the Civil War. Arab.rose's idea of a parallel biography works fairly well: it's a bit like trying to watch two movies at once. Information on the two men abounds and Ambrose covers the military careers of his subjects--Custer's rise to brevet Major General during the Civil War, Crazy Horse's tenure as "shirt-wearer" among the Sioux--in considerable detail and with competence. Custer emerges as he always, does: a convenient hero for the Democrats, foolishly brave, flamboyant but superficial and boyish to the point of pain. Crazy Horse The Noble Savage, is deep, proud, as enigmatic to his own people as he is to his white biographers. The warriors' women also figure. Little is known of Black Buffalo Woman, Crazy Horse, lover, or of Black Shawl, his wife; enough is known of Libbie Custer to make Ambrose's inordinate praise of her seem rather puzzling. Ambrose is the sort of hearty writer who expresses approval with the phrase "damned good" and apparently still believes in a manifest destiny which exonerates.